Mt. 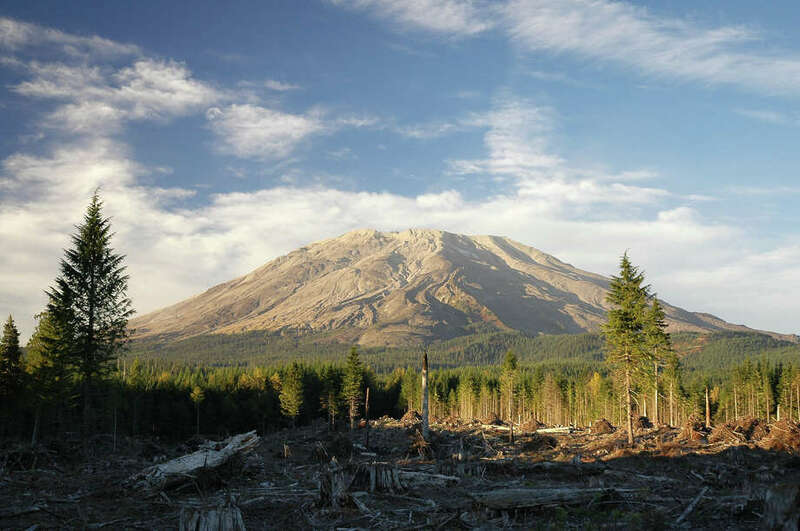 St. Helens, one of the less prominent yet massive peaks of Washington State's Cascade Range, made history on May 18, 1980, by erupting with the force of 500 atomic bombs, devastating 230 square miles of formerly verdant forest and killing 57 people. After considerable debate about what to do with the decimated landscape in the aftermath, Congress sided with scientists advocating it be left alone for research and education. In 1982 Congress created the 172-square-mile Mt. St. Helens National Volcanic Monument to be managed by the U.S. Forest Service, which had already been overseeing the forests on the flanks of the mountain as part of the surrounding 1.3 million acre Gifford Pinchot National Forest. But in 2007 federal budget cuts coupled with diminishing visitation led the Forest Service to close one of its two primary visitor centers at Mt. St. Helens and scale back on its interpretive and management services. At that point, representatives from surrounding communities and environmental groups and U.S. Senator Maria Cantwell came together in an effort to convince Congress to switch Mt. St. Helens over to a national park, which would ensure a larger funding pool for visitor services and amenities and ideally spur more visitation, which would in turn mean more business for struggling local communities. Instead of pushing for national park status, however, Cantwell and her Congressional colleagues asked the Forest Service to detail how they plan to protect Mt. St. Helens while expanding visitor services and recreational opportunities. The Forest Service subsequently put into place a new plan which, with help from the recently formed Mt. St. Helens Institute, would expand services and explore new options for overnight visitation. Tourism has since grown, but many still want to see Mt. St. Helens a national park. Indeed, recent research by Michigan State University shows that national parks are huge economic engines, pumping nearly $13 billion in economic activity into gateway communities while supporting 250,000 jobs. "For every dollar spent on national parks, four dollars are returned to the economies of gateway communities," said Sean Smith, policy director for the National Parks Conservation Association. "More than 7 million people visited Washington's national parks last year alone and national parks nationwide received near record-breaking visitors, despite one of the toughest economies in decades." But perhaps more important, said Smith, is that Mt. St. Helens "is likely the most iconic American landscape currently not in the national park system [with] natural, cultural and historic wonders on par with other parks such as Olympic, Zion and Crater Lake." He added that national park status would better protect Mt. St. Helens' natural treasures from potential housing developments and even a proposed open pit gold mine that would be visible from the main visitor center and would decimate one of the most remote and pristine parts of the Gifford Pinchot National Forest adjacent to Mt. St. Helens' lower flanks. While the debate continues, Mt. St. Helens remains an amazing example of Mother Nature's fury and her restorative powers. Whether it's a national monument or a national park, it's well worth a visit. Contacts: Mt. St. Helens National Volcanic Monument, www.fs.usda.gov/mountsthelens; National Parks Conservation Association, www.npca.org; Mt. St. Helens Institute, www.mshinstitute.org. Dear EarthTalk: Do environmentalists think the Endangered Species Act has been a success or failure with regard to protecting biodiversity in the U.S.? -- Ron McKnight, Trenton, N.J. While that very question has been a subject of debate already for decades, most environmental advocates are thankful such legislation is in place and proud of their government for upholding such high standards when it comes to preserving rare species of plants and animals. That said, critics of the legislation make some solid points. For starters, only one percent of species (20 out of 2,000) under the protection of the Endangered Species Act (ESA) have recovered sufficiently to qualify for delisting. And the millions of dollars spent on often failed recovery efforts are difficult to justify, especially in these otherwise tough economic times. But even though the vast majority of species protected under the ESA have not recovered doesn't undermine the significance of those species -- bald eagles, gray wolves and grizzly bear to name a few -- that have rebounded thanks to forward thinking legislation and wildlife management. Louisa Wilcox of the Natural Resources Defense Council is grateful to the ESA for the continued existence of grizzly bears in and around Yellowstone National Park. "After listing, the government cleaned up the massive garbage problems in Yellowstone Park, which reduced the habituation of bears to human foods -- a pattern that often leads to grizzly deaths," she reported. Commercial sheep herds were moved out of core grizzly habitat while hundreds of miles of roads on public lands in the region were closed to improve the iconic bears' chances for survival. The result: The Yellowstone grizzly population more than doubled while human/bear interactions and incursions by hungry grizzlies onto local ranches have declined. "So, by any reckoning, the Yellowstone grizzly bear story is an ESA success," concluded Wilcox. To test whether or not the ESA has been effective on a grander scale, the Center for Biological Diversity (CBD), another leading green group, compared for its 2012 "On Time, On Target" report the actual recovery rate of 110 listed species with the projected recovery rate in their federal recovery plans. The 110 species occupy all 50 U.S. states, include all major taxonomic groups, and have various listing lengths. CBD found that the ESA had "a remarkably successful recovery rate: 90 percent of species are recovering at the rate specified by their federal recovery plan," adding: "On average, species recovered in 25 years, while their recovery plan predicted 23 years -- a 91 percent timeliness accomplishment." CBD also confirmed the hypothesis that the majority of listed species have not enjoyed protection for long enough to warrant an expectation of recovery yet. "80 percent of species have not yet reached their expected recovery year," reported CBD, adding that on average species have been listed for just 32 years, while their recovery plans required 46 years for success. This recent study's findings echo the results of an earlier (2006) analysis in the Northeastern U.S. that found some 93 percent of federally listed species there were stabilized or improving since getting ESA protection and 82 percent were on track to meet recovery goals. "When judged in the light of meeting recovery plan timelines for recovery, the Endangered Species Act is remarkably successful," CBD said. "Few laws of any kind can boast a 90 percent success rate." Contacts: CBD, www.biologicaldiversity.org; "On Time, On Target" Report, www.esasuccess.org.